The Writer's Challenge: Q&A with the "So You Want to Write a Novel" Guy! Shoshanna: What made you create the viral Youtube video, So You Want to Write a Novel? David Kazzie: About a year ago, I decided to take a break from writing fiction and I started writing a weekly humor blog. Because the world needed another writer's blog, right? I'd always wanted to do a humor piece about practicing law (my day job), but I couldn't come up with an angle that wasn't already tired and cliched -- making fun of lawyers is not, surprisingly, a unique subset of comedy. Then I saw a hilarious video called iPhone 4 vs. HTC Evo, created with Xtranormal's super-easy-to-use animation website, and I thought the format would work well for a conversation between a jaded lawyer and idealistic law student. I wrote So You Want to Go to Law School one weekend and posted it to YouTube. Much to my amazement, it blew up within a few days, and it has since gotten about 1.4 million hits. A bunch of other So You Want To... videos started popping up all over the place, but I realized around Thanksgiving that no one had done one about writing and publishing. I thought the Law School format would work well for a writing video too, so I sat down on the day before Thanksgiving, banged out the script for So You Want to Write a Novel, and sent it out on its merry way. I was really trying to roll every horror story, every misconception a new writer might have about the business into one clueless character. It caught fire over Thanksgiving weekend and started making the rounds with literary agents, editors and writers. Shoshanna: How did you get your literary agent? David Kazzie: At its peak in early December, the Novel video was getting shared on Facebook several hundred times per hour. I stumbled across a bunch of literary agencies and authors that had posted the videos on their public Facebook pages, including the Ann Rittenberg Literary Agency. This thrilled me because Ann represents Dennis Lehane, one of my favorite writers. I left a comment thanking them for posting the video, and I didn't think much else of it at the time. A few days later Ann contacted me directly. We got to talking, and I explained who I was, what I had done, and where I planned to go with my career. We chatted off an on for the next month or so, she began reading my blog archives, and at the end of January, she offered to represent me and my career going forward. It was really unbelievable. Shoshanna: You have an agent but you just self-published your debut book. Why? Shoshanna: Will you continue to self-publish books if you end up selling to New York? Shoshanna: How has your experience with self-publishing been so far? Sales good? David Kazzie: Like I said earlier, it was a TON of work to get the book ready for publication. I hired an editor, a cover artist, and an e-book formatter. I read my novel about eight times in 6 weeks. It was very rewarding to see the finished product, but it was exhausting. As for sales, I've tried to find statistics for other self-pubbed authors' first month or two of sales, even the ones that went one to be huge successes, and I'm happy to say that my early numbers exceed many of those. But time will tell if I can match those authors' big explosions down the road. I hope so. Shoshanna: Do you worry about the stigma self-publishing has had in the past, or do you think the stigma has disappeared now that many traditionally published authors are dipping their feet into the self-publishing waters? David Kazzie: I thought I would worry about the stigma, but I really haven't. Like you said, so many traditionally published authors are giving it a shot. Plus, my goal is to become a full-time fiction writer, and if self-publishing opens that door for me, I for one welcome our new e-reader overlords. An author who flatly refuses to consider self-publishing as an option is really just hurting himself and ignoring the reality of what's happening in publishing. Shoshanna: Where can we sample and buy your book? It hasn't been a very good day for attorney Samantha Khouri. She's been passed over for partner at her law firm, she's coming down with the flu, and she's discovered that her parents' business is teetering on the brink of failure, thanks to a brother widely known as the world's dumbest terrorist. But when she discovers her financially desperate boss is planning to steal their new client's gigantic winning lottery ticket, she realizes her day is just getting started. 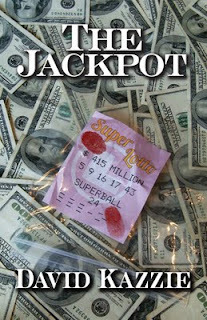 After witnessing a violent confrontation that leaves the ticket in her hand, Samantha will risk everything to return the $415 million fortune to its rightful owner. But Samantha's nothing-to-lose boss isn't the only one hunting for the ticket. A homicidal mercenary has been hired to track it down at all costs, and he will stop at nothing to find it. And as her pursuers close in, Samantha must resist the growing temptation to show up at SuperLotto headquarters, smile for the camera, and walk away with the biggest jackpot in American history. HI David, Shoshanna! What a fabulous interview! I adore that video - played it for my husand and we were hysterical. Good luck with your book - it sounds like a great premise. Hi Jennifer -- thanks for the kind words. I appreciate your taking the time to read the interview, and so glad you liked the video. Thanks Jennifer for stopping by, and thanks David for being on The Writer's Challenge! I'm reading your book The Jackpot right now and finding it very entertaining. It would make a good movie too - maybe your agent could sell the film rights to it! Great interview. The video is hilarious and your novel sounds really interesting. Authors definitely have a lot to think about these days when considering where to take their careers and what do to with each project. Sounds like you've made great choices so far, David! Thanks Heather. I think the most important thing is to consider all your options, and think about which ones can get you to your destination. It's hard to accept all these new avenues after years of being conditioned to think there was only one route to publishing success -- I struggled with getting over that for a long time, but once you treat it like a business, the decisions become a little clearer, a little easier to make. Love the interview and the video. Good luck with your business career. I've been doing this for more years than you are old and will continue for a lot longer. Actually, it's an obsession.